Keep your surfaces protected and fashionable with these beautiful yet functional coasters. 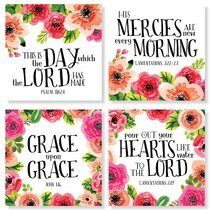 This set features absorbent ceramic and cork backs with lovely floral designs and Scripture sentiments, perfect for adding a touch of wisdom and beauty to your cup of coffee, water, or sweet tea. This is the day which the Lord has made. About "Ceramic Square House Coaster Set of 4: Floral/Red/Pink"